Kiev - Euro 2012 reaches its climax in Sunday's final in Kiev, when defending champions Spain will bid to hold off an Italy side who have steadily eased into form in trademark fashion. 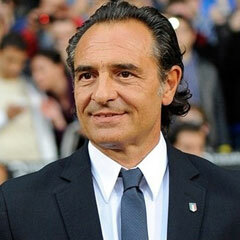 "We are looking for Spain's weak points and we'll be working on that, but it won't be easy," said Prandelli, whose side beat Spain 2-1 in a friendly in August last year. "They are world and European champions." Spain and Italy drew 1-1 in their opening Group C game -- Cesc Fabregas cancelling out Antonio di Natale's opener -- and it will be the fourth time that two teams who have met in their first game resume hostilities in the final. Fabregas was used as a 'false nine' in that game, but Spain coach Vicente del Bosque appears to have doubts over who is the best player to spearhead his attack. Fernando Torres played up front in the 4-0 win over Ireland and the 1-0 defeat of Croatia, while Alvaro Negredo started in the 0-0 draw with Portugal but was replaced by Fabregas early in the second half. An engaging tournament requires only a memorable final to confirm its status as a modern classic, but Spain will need to awake from their slumber if they are to overcome a disciplined and committed Italy side. The champions must also shake the weariness from their legs after 120 minutes of graft against Portugal, although they will benefit from an extra day's rest.